Eastern religious sect that professes and practises an admixture of Christian, Jewish, and heathen doctrines and customs. The members of the sect live in Lower Babylonia, in the territory of Wasiṭ and Bassora, near Khuzistan, and speak the languages of the localities in which they are settled (Arabic and Persian). Their sacred books are in an Aramaic dialect which has close affinities with that of the Talmud of Babylon, and they are written in peculiar characters resembling Old Palmyrenian script. Besides the name "Mandæans," derived from (= "word of life"), the most important figure in the Mandæan religious system, they take, in their dealings with other communions, the name of "Sabians," and call the wise and learned among them "Nasoræans" ( ). To European scholars of the seventeenth century, who first heard of their existence through Christian missionaries, they were known under the erroneous appellation of "Christians of St. John" (the Baptist), on accountof the reverence in which St. John is held among the members of the sect and because of their frequent baptisms. The sacred books of the Mandæans consist of fragments, of various antiquity, derived from an older literature. Of these the most important is the (="treasure") or (="the great book"), which dates from somewhere between 650 and 900 C.E. It is divided into two unequal parts: the larger, intended for the living, is termed (="to the right hand"); the smaller, containing prayers to be read on the burial of priests, is called (="to the left hand"). 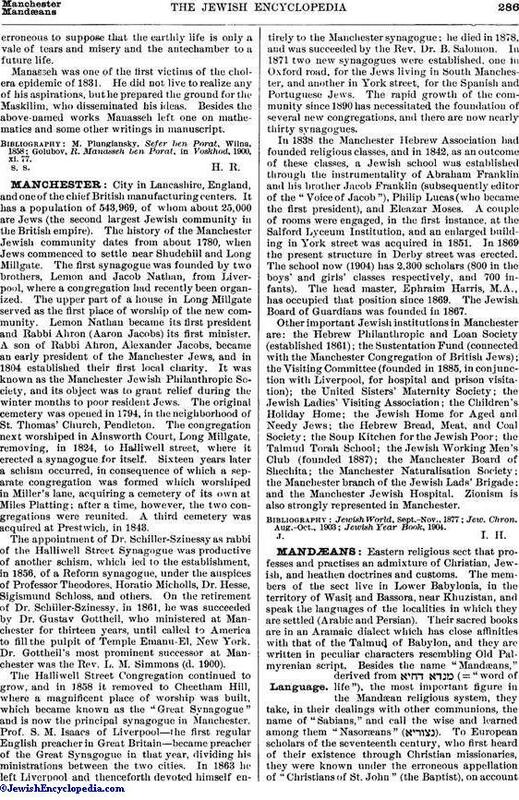 In this book, and in some other works of lesser importance, is expounded the Mandæan religious system, in which Jewish influence is distinctly visible. It is essentially of the type of ancient Gnosticism, traces of which are found in the Talmud, the Midrash, and in a modified form in the later Cabala. The gives three conflicting accounts of the Creation, the least complicated of which may be summarized as follows: A triad of divinities existed at the beginning of all things—Pira Rabba (="the great fruit"), Ayar Ziwa Rabba (="the ether of great brilliancy"), and Mana Rabba. 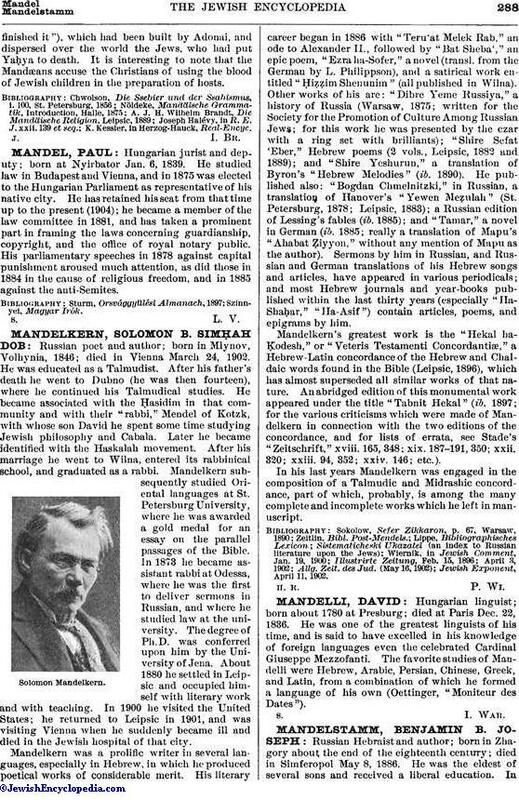 (According to Joseph Halévy, Mana is the Biblical , which the Talmud and Midrash regarded as a celestial food. The connection between Pira and Mana is easily explained by the Gnostic idea which compares the divine essence to the grain of a fig.) The last-named, the most prominent of the three, is the King of Light, from whom all things proceeded. From him emanated the Great Jordan, which permeates the whole ether, the domain of Ayar. (The idea that water, air [ether], and fire existed before the creation of the world is found in a Palestinian midrash of the fourth century; see Epstein, in "R. E. J." xxix. 77.) Then Mana called into existence Ḥayye Ḳadmaye ("primal life"), and, when the act was accomplished, withdrew into strictest privacy, being visible only to the souls of pious Mandæans. As the revealed and governing deity, Ḥayye Ḳadmaye is entitled to the chief worship and adoration. Ḥayye Ḳadmaye produced, besides the numerous angels ( ) that arose from the further development and combination of these primary manifestations, Ḥayye Tinyane ("secondary life"), or Yushamin (= , the Jehovah of the Hebrews being considered by the Gnostics as a divinity of second rank). The next emanation after Yushamin was Manda de-Ḥayye ( ), the Primal Man ( ; in the Cabala, ). Then a revolution occurred in heaven. Yushamin attempted to seize the government, but failed, and was punished by ejection from the pure ethereal world into that of inferior light. (A similar story of the revolt of Satan and of his banishment to the subterranean regions is found in the haggadic literature; see Gen. R. iv.) Manda de-Ḥayye revealed himself to humanity in a series of incarnations, first taking the forms of the three brothers Hibil, Shitiel, and Anosh (the Biblical Abel, Seth, and Enoch). The most prominent of these is Hibil, who possesses the same attributes as Manda de-Ḥayye, with whom he is often confounded. Among the "'utre" (angels) who emanated from Ḥayye Tinyane the most prominent is Ḥayye Tlitaye ("third life"), often called Abatur ("father of the 'utre"). He sits on the verge of the world of light that lies toward the lower regions, and weighs in his balance the deeds of the spirits ascending to him from the earthly life. Beneath him originally was an immense void, with troubled black water at the bottom in which his image was reflected, the reflection ultimately becoming solidified into Petaḥiel, called also Gabriel, who partakes of the nature of matter. Petaḥiel received the mission to build the earth and to people it. Accordingly he made Adam and Eve, but was unable to make them stand upright; whereupon Hibil, Shitiel, and Anosh were sent by Ḥayye Ḳadmaye to infuse into their forms spirit from Mana Rabba himself. Hibil then instructed man in the true religion, and apprised him that his Creator was not Petaḥiel, but the Supreme God who is far above him. Petaḥiel was then exiled to the under world, made up of four vestibules and three hells. Each of these vestibules has two rulers—Zartay and Zartanay, Hag and Mag (see Gog and Magog), Gaf and Gafan, Antan and Kin. In the highest hell rules the grisly king Shedum (in-Haggadic literature, Ashmedai; see Asmodeus). Invested with the power of Mana Rabba, Hibil descended into these lower regions and brought forth Ruḥa, the mother of falsehood and lies, the queen of darkness, and prevented her return to the nether world (see Lilith). She then bore the devil Ur; he in his pride sought to storm the world of light, but was overpowered by Hibil, who cast him into the black waters and imprisoned him within seven iron and seven golden walls. By Ur, Ruḥa bore three sets of sons, seven, twelve, and five respectively. They all were translated by Petaḥiel to the heavenly firmament, the seven forming the seven planets and the twelve the signs of the zodiac, while the fate of the remaining five is unknown. According to the Mandæan belief the appointed duration of the world is four hundred and eighty thousand years, divided into seven epochs, in each of which one of the planets rules. The whole human race, with the exception of one single pair, has been destroyed three times. The Mandæans consider the Biblical saints as false prophets. 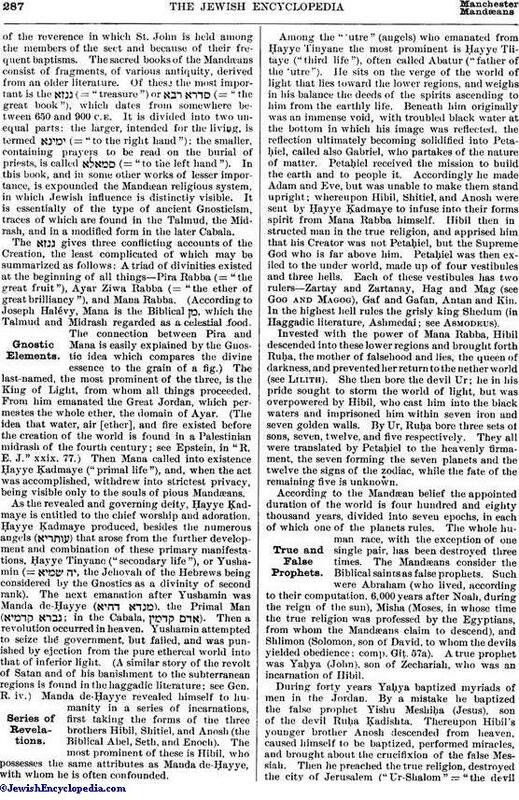 Such were Abraham (who lived, according to their computation, 6,000 years after Noah, during the reign of the sun), Misha (Moses, in whose time the true religion was professed by the Egyptians, from whom the Mandæans claim to descend), and Shlimon (Solomon, son of David, to whom the devils yielded obedience; comp. Giṭ. 57a). A true prophet was Yaḥya (John), son of Zechariah, who was an incarnation of Hibil. During forty years Yaḥya baptized myriads of men in the Jordan. By a mistake he baptized the false prophet Yishu Meshiḥa (Jesus), son of the devil Ruḥa Ḳadishta. Thereupon Hibil's younger brother Anosh descended from heaven, caused himself to be baptized, performed miracles, and brought about the crucifixion of the false Messiah. Then he preached the true religion, destroyed the city of Jerusalem ("Ur-Shalom" = "the devilfinished it"), which had been built by Adonai, and dispersed over the world the Jews, who had put Yaḥya to death. It is interesting to note that the Mandæans accuse the Christians of using the blood of Jewish children in the preparation of hosts. K. Kessler, in Herzog-Hauck, Real-Encyc.